Outer Space 2: Popplet, The Planets, The Solar System, and Beyond | Poppletrocks! Popplet is perfect for space research because it offers explorers an almost infinite canvas for logging their findings! Pan out to infinity, pan in for a closer look. Use Popplet Linker and Popplet Comments to keep your data in order. Give awesome professional presentations using one of Popplet’s two presentation modes. The only things that might hold back your cosmic investigations are Popplet’s popularity and it’s servers, which aren’t quite infinite, not yet anyway! We visited our closest celestial neighbor in our previous article, Outer Space 1: Moon Popplets – check it out. Our moon is a fascinating place and it’s been influencing our own planet, and everything that has ever existed on it, forever! Great work, and adaptable for any grade and any planet or celestial body. Thank you, Jessie! The second graders at Chesterbrook Academy created “amazing planet projects” in art class, using Popplet to write down the facts that they learned. Marvelous work. There definitely comes a time when looking up at something just isn’t enough, and you have to figure out a way to get closer, and maybe even get to what you’re looking at. That’s precisely what happened in the middle of the last century with the Space Race, the unquestionable highlight of which just has to be the first moonwalk. The Year 5 students from Upton Heath Primary School, Chester, England made Popplets about these historical events. Some of them even included their photos, as a signature – and why not? – all great artists should sign their work! How to survive the incredibly long journey times? What conditions are needed for human survival once we get there, wherever “there” might be? The Milky Way is what we call our galaxy. It is also home 100 billion other planets, But there are a lot more galaxies than ours in the Universe, and they come in all shapes and sizes and can be quite different. 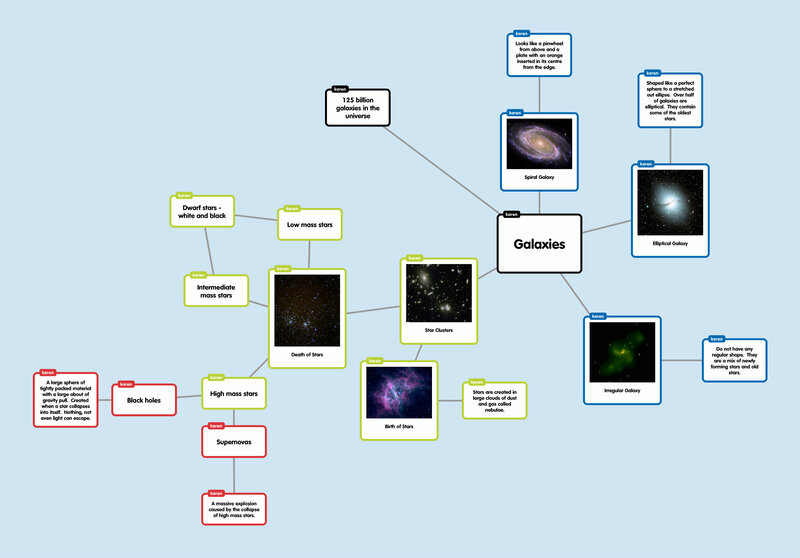 We can see in this Galaxies Popplet, from My Library Learning. The Earth is part of a Solar System, reliant on what we call the Sun. We are but one of many solar systems in the Milky Way, which is one of 125 billion known galaxies in the Universe. And there’s more…now scientists are talking about an infinite number of universes: the Multiverse. With those mind-boggling facts, we will leave you to ponder, as we now are. The moon seems a lot closer than it did at the beginning of this article! Are you using Popplet to map the stars and unravel the mysteries of outer space? If you are, we’d love to hear from you. Share with us, the Popplet community, on our Twitter and Facebook Page. Sign up for a free web account at the and we’ll give you ten free Popplet boards. And of course, may the force be with you, always! This entry was posted in Outer Space, Popplet, Popplet Examples and tagged galaxy, multiverse, planets, popplet examples, solar system by Gary Darling. Bookmark the permalink.